Tea ceremony and kimonos are deeply connected to each other. There are many elements of the tea ceremony that assume you are wearing a kimono while performing it – for example, at some point while preparing tea, you take out your fukusa (a small cloth for wiping tea utensils) out of your kimono’s breast pocket and then put it in your obi. 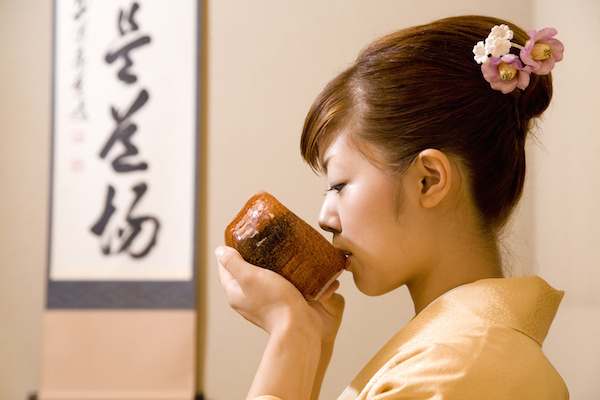 That’s why there are many people knowledgeable about kimonos among the tea ceremony experts. On the other hand, because kimono is not longer something people wear everyday, it wouldn’t be practical to ask people learning tea ceremony to wear it every time. That’s why many changes were introduced to allow people to take part in tea ceremony while wearing western-style clothes. An representative example would be the so-called “keikogi”, which is shaped like a vest and it looks as if it was made from sleeves detached from a kimono. Those who are thinking about learning tea ceremony should ask their teachers about the specifics and not decide anything on their own, because the rules change from teacher to teacher. It is also not necessary to wear a kimono if you were asked to participate in a tea ceremony as a guest. The spirit of tea ceremony says to welcome every guest in the same way regardless of their clothes. Of course, if you come to a tea ceremony wearing a kimono, it would surely make the organizers happy, so if it’s possible, we recommend putting one on.